Cats and Cards don't mix! I always have "help" from my cat Marvin whenever I'm making cards. He loves to bite any piece of paper that moves and has "autographed" a lot of things. Paper strings are a favorite of his, along with anything that looks like it might move. 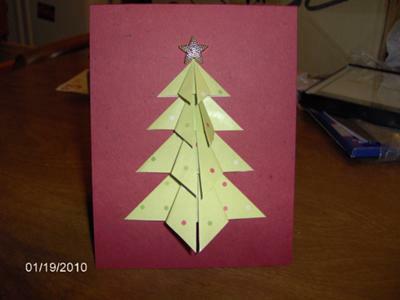 Last year I found the instructions for Origami Christmas Tree cards at Seasons of Stamping website, and was so pleased with myself after finishing the very first one. It really did look good! I can't remember what made me get up - either the doorbell or the phone rang - and when I got back, there was Marvin, happily munching on the tree! Luckily, I was able to take it apart and re-do the chewed parts, but learned a valuable lesson. Never turn my back on a finished card when Marvin is around!! What a lovely story and I am sure Marvin is a much loved cat .... despite his card making efforts! Origami is a fabulous way to use up papers. There are so many ways and ideas to fold the paper. 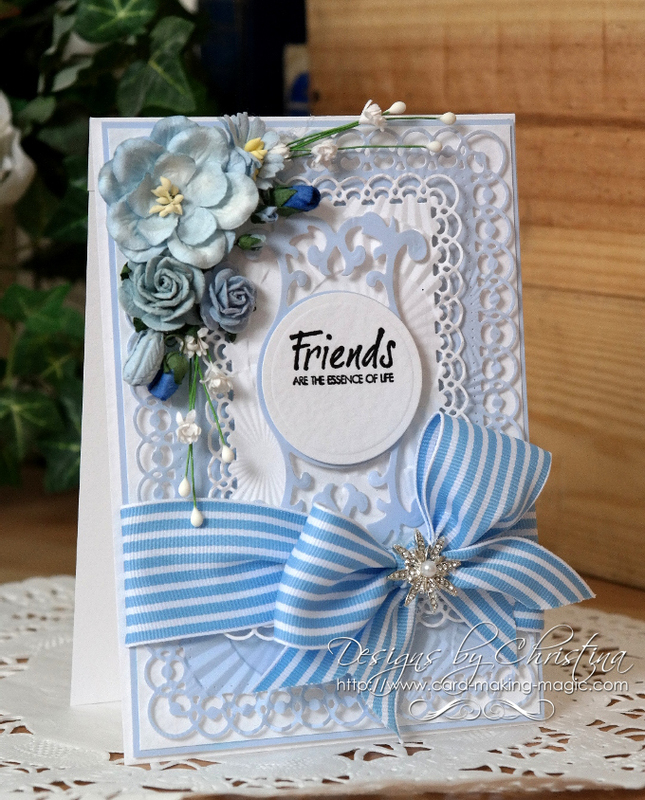 It takes some practise to get good results and this one is just lovely even after Marvins input. But I suppose lesson learned and he will now be banished from a finished card. Comments for Cats and Cards don't mix! Of course cat's hair is everywhere. It seems to have a ghost-like life so we cannot always see it to catch it with the vacuum cleaner. Like the others, I totally relate! My biggest problem with card making and kitties is the ever-present issue of kitty fur on my cards. I have 2 long-haired kitties, and I brush them as I should, and keep an otherwise clean and well-vacuumed home, but cat fur is a never-ending battle! Anyone else with this problem? Regardless of what kind of adhesive I use, I will be picking cat fur out of it with tweezers. For example, I can use a tape runner, and invariably kitty fur will have somehow managed to adhere itself to the runner so that when I run the tape across my project, I'll often find several kitty hairs glued to my project. It makes me crazy! This was never an issue until I got long-haired furrbabies. I grew up with a short-haired kitty, and this was never an issue. Any suggestions, I'd love to hear them! Cats and cards do not mix your right my cat loves a good bit of paper to chew but its never my scrap paper always my cads. Love the christmas tree card. 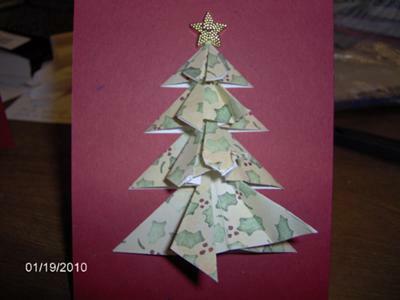 lovely christmas tree.my previous cat loved tearing and biting paper too.must be fun trying to make cards! Fantastic ! It's really well crafted. Lovely Xmas trees. Your folding looks very neat.